Making vehicles requires a lot of people and equipment. You have to manage many simultaneous processes to ensure your production line stays efficient. Automobiles need to be shipped on time to meet your demanding customer schedules, which means you cannot afford any downtime. 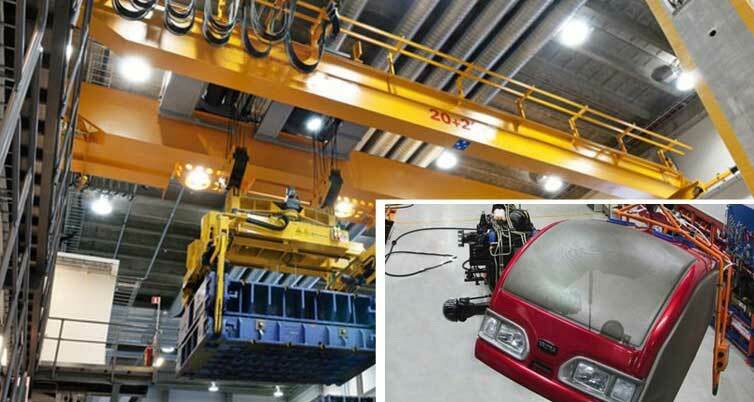 You need fast, safe and reliable equipment, and Ebon crane provides automotive cranes and other lifting solutions that help you manage your industrial challenges. Whether you are moving steel coils, pressing engines or car body parts, constructing the engine, or putting together the whole car, we have the equipment to fit the task. Applications include engine plants, foundries, press shops, die changing, general purpose and works station cranes and hoists. In addition to the motor car industry, we supplies crane solutions to the heavy goods vehicle producers, specialist vehicles construction equipment, tractor plants, military vehicles and vehicle maintenance applications. Ebon crane assists companies wherever loads have to be lifted and transported in the factory. Workplaces can also be equipped with particularly ergonomic solutions with Ebon.